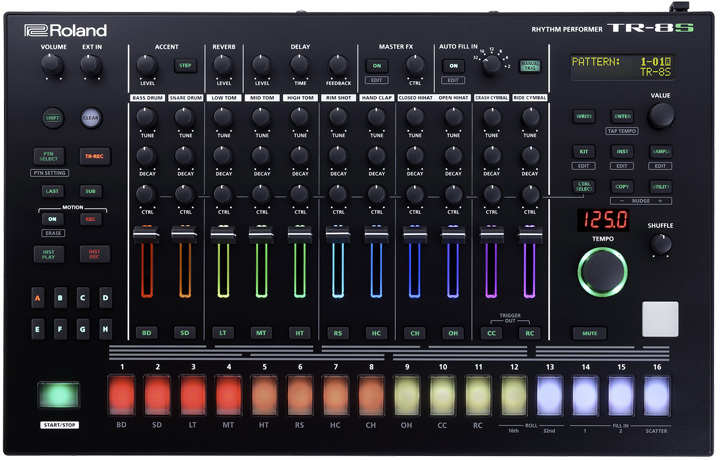 Upon its release in 2014, Roland’s TR-8 Rhythm Performer put the company’s classic drum machines like the TR-808 and TR-909 into one affordable hardware unit. In the face of skyrocketing prices for the vintage instruments, the TR-8 was welcomed by many music makers who wanted tangible control over their Roland kicks, hi-hats, cowbells, and claves, without spending enormous sums. Today, Roland announced the release of the TR-8S, which promises the same 16-step sequencer and all of the sounds from the 808, 909, 606, 707, and 727 machines. It's also packed with a host of new features, including the ability to import, edit, and sequence outside samples, as well as a new effects section with delay, reverb, tape echo, compression, and LFO. The addition of sampling makes the TR-8S a much more versatile instrument. After importing your samples through an SD card, you can then adjust the start and end points, the playback direction, pitch, and decay through onboard controls. The effects and velocity (through a new trigger pad) can be determined individually for each step. Whereas the TR-8 could only hold 16 patterns, the TR-8S can save up to 128, each with eight variations and three fills. And Roland doubles the amount of audio outputs, from four to eight analog outs. The TR-8S is expected to be available later this month for $699 USD and €699. Introducing the Roland AIRA TR-8S: Rhythm Performer Meets Sound Designer.